Even though the companies involved have finally come together in a consortium and finalized a standard, wireless charging is still struggling to gain acceptance. But a new technology called adaptive resonance from Fulton Innovation promises to bridge the gaps between devices, and make wireless charging pads less difficult to use. With current hardware a device has to be perfectly positioned on an inductive pad before charging begins. And while strong magnets are used to ensure the alignment is perfect, it's an inconvenience that adaptive resonance promises to overcome. As demonstrated by Fulton in this clip, a device can be placed anywhere on a wireless pad using the new technology, and even when raised slightly off the service it will still keep charging. And devices with different power draws can all share the same pad since the adaptive resonance technology will automatically adapt and deliver the right amount of juice to each one. 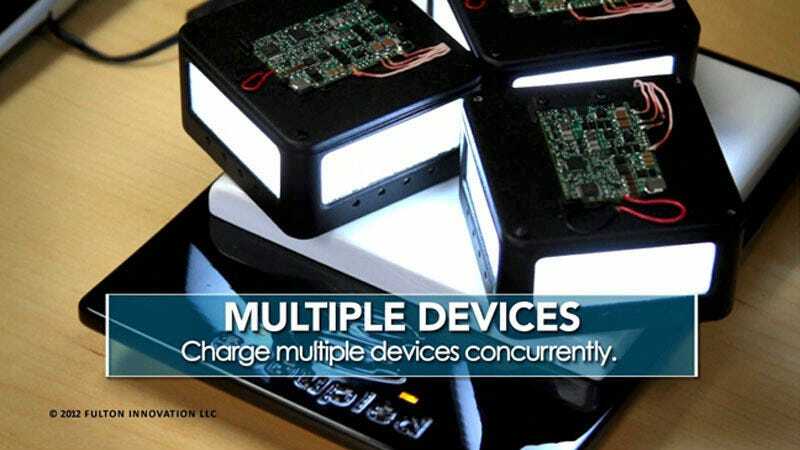 The new technology can even allow a device to be used on charging pads from different manufacturers, which is another important step towards wireless charging becoming more commonplace. It means consumers don't have to worry about compatibility when choosing hardware, they can just buy based on their personal preferences and know the hardware will automatically sort itself out as they use it.